Adorable snowball fight and that pink buffalo plaid! LOVE! I love the glittery scarves on the penguins! AND oh my goodness...that hot pink buffalo plaid really packs a punch!! I absolutely love it! Darling winter scene with these adorable penguins! 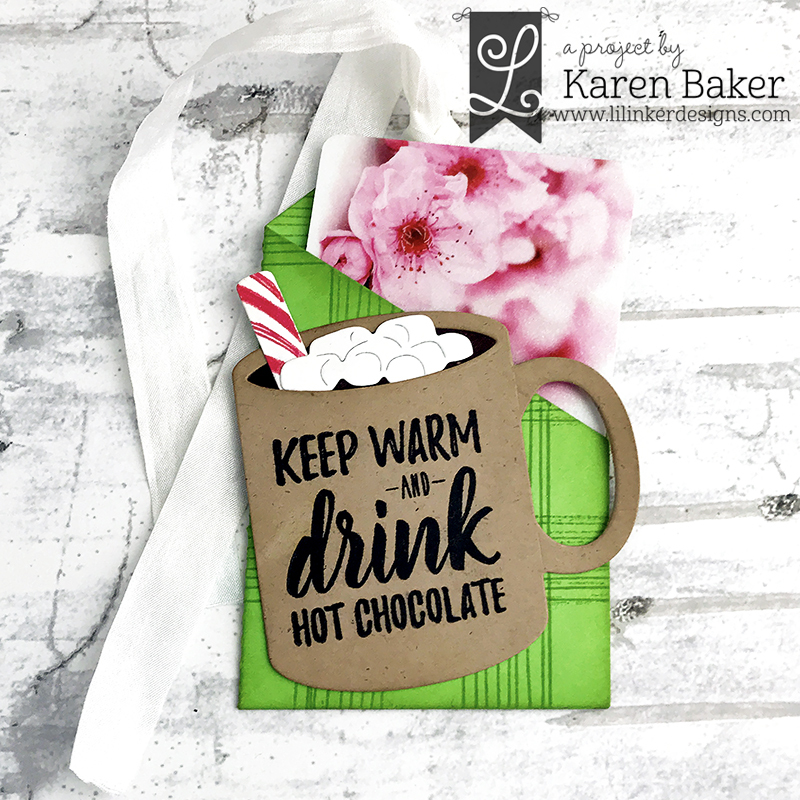 Sweet card with awesome coloring! And your second card with the awesome buffalo plaid background.... great color combo! I'm lovin' those penguins! Very cute cards. The penguins are so cute! 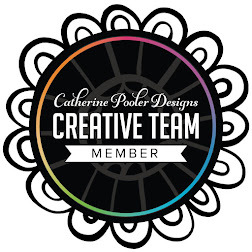 And I absolutely adore the gorgeous, bold pink and black background. That stamp set is my favourite in this release! This whole release is so fabulous!!! Fabulous card! oh goodness, LOVE the colour combo you have used and the little snowball fight, haha, this bundle is just TOO Fun! I was having a hard time choosing what color I liked the plaid in most … you've settled it! Fuchsia 100%!! lol These are so cute. Those penguins are so adorbs!! Your penguins are just the cutest in their non traditional colors! Karen, these are great. 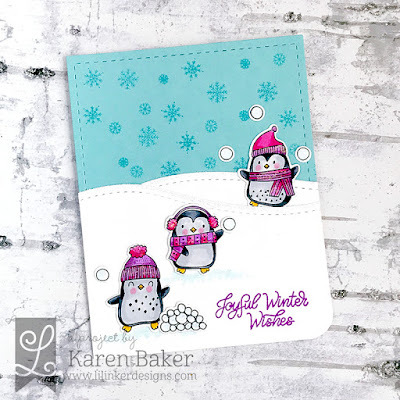 I always love a snow scene on a Christmas/winter birthday card and this is so cute with these playful penguins. I LOVE the plaid Birthday hugs card. Both of our little grandsons LOVE buffalo plaid (I got them red/black plaid housecoats for Xmas b/c they begged their Mom for them while shopping. ), and they both have birthdays coming right up after Christmas. So I KNOW that they would love this card. Well done. The penguin scene you created is awesome! 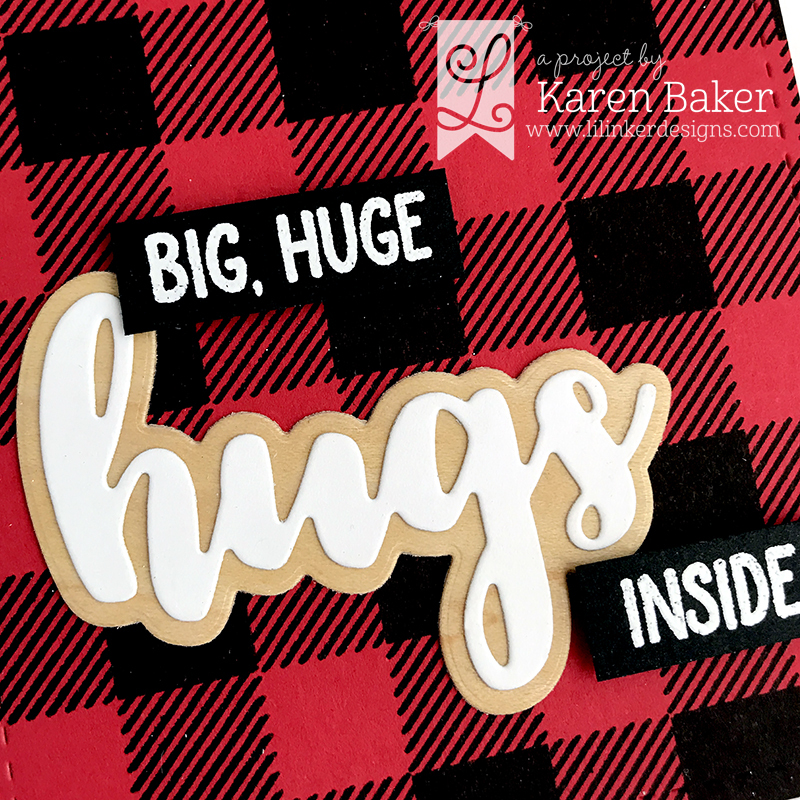 Love your plaid card, and that plaid doesn't have to be for Christmas! The plaid and penguins are darling! Amazing cards. That pink and black check.... incredible! How bout them penguins.... love!! WOW ! 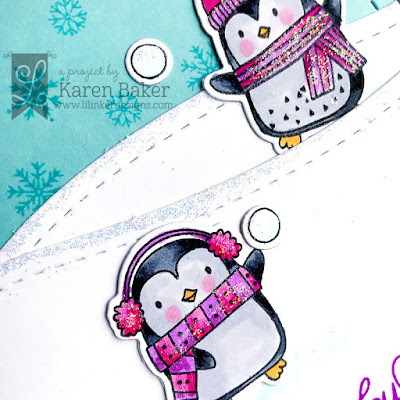 Loving those pops of pink on both cards, your penguins look so fashionable in their pink glitter winter wear, really wonderful. Thank you for inspiring me. Gorgeous combo of colours for your plaid card!!! Love Penguins!!! 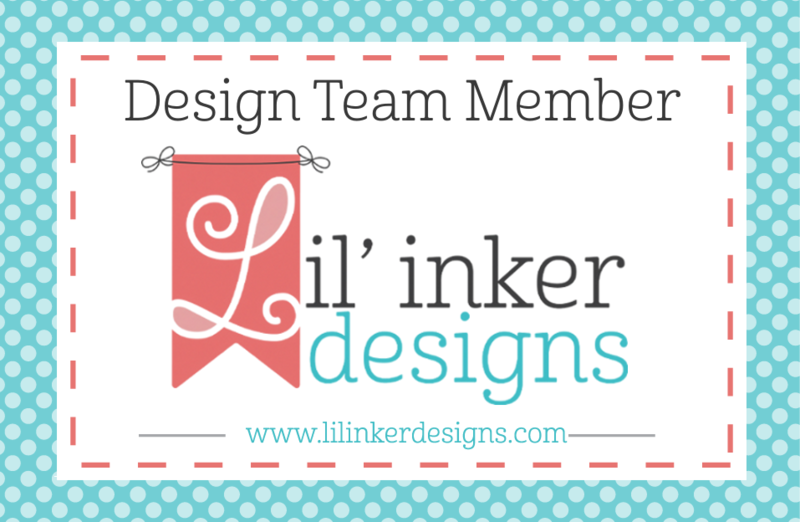 Beautiful layout for your first one! OH I LOVE THE PINK! what cute cards! I really like the sparkle on those penguins and the pink! Cute cards. The pink plaid is great. That plaid stamp really has my attention. 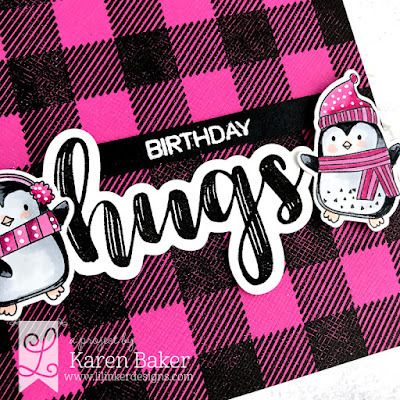 Love the adorable little penguin scene you created and that plaid background stamp...awesome! Oh how fun! I really love your color palette too Karen! These are delightful and perfectly festive! Cute penguin scene and I like the color of the buffalo plaid. The penguins at play in the first one makes me think of the scene in The Bishop's Wife where the bishop's daughter wants to be in the snowball fight with the "big kids" and Cary Grant's character lends an aid. :) And the second has the beautiful fuchsia plaid background. Love this new Buffalo Plaid stamp and that color combination of fuchsia and black!! Great cards!! You can't help but smile when you see those penguins. Adorable! Love the great scene you created in the first card and the 2nd with the buffalo plaid is beautiful. Oh so adorable and fabulously festive! Love the bright pink on both cards. I've fallen in love with these playful penguins! Your cards are super cute! These penguins are so cute and they look like they are having so much fun! 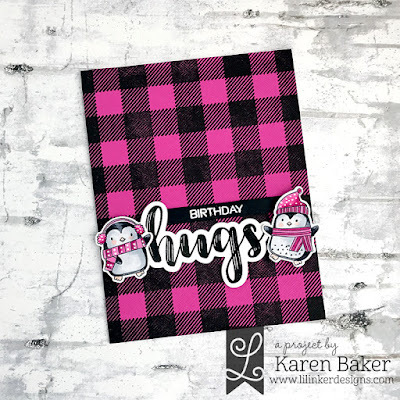 The Buffalo Plaid stamped on the fuchsia is amazing! It is so bold and really makes a statement. This would be fun for Valentine's Day too. Lovely palettes on both your cards, those penguins are so cute.